Grav is a modern web application that requires no database. It's a file-based web platform that's simple, fast, and requires zero installation. Grav uses modern technologies including Twig Templating for templating, Markdown for content creation, YAML for simple configuration, Parsedown, and Doctrine cache for performance layer etc. The tool is written in PHP and comes with the powerful Package Management System that allows you to manage the Grav system, including install and upgrade Grav itself, as well as themes and plugins. In this tutorial, I will show you step by step how to install and configure Grav CMS on Ubuntu 16.04. As Grav is PHP web application-based, we need to install PHP on the system, and to get more performance, we will be using PHP-FPM with Nginx web browser. In this first step, we will install the Nginx web server from the Ubuntu repository. Before we do that, we need update all packages and repository using the following apt commands. Now install the Nginx web server. After the installation is complete, start the service and enable it to launch at system boot, something which you can do using the following systemctl commands. The Nginx web server has been installed on Ubuntu 16.04, and it's running on the default HTTP port 80. Check it using the netstat command in the following way. And you will get the result as shown below. Now we will install and configure PHP-FPM for our Grav installation. Install PHP and PHP-FPM packages (including all required extensions) using the following command. Now we need to configure PHP-FPM. This is optional, but it's best for Grav performance. We will install some additional extensions manually from the PHP extensions repository using the PECL command. Install the 'apcu' extension (for increased cache performance) using the 'pecl' command below. Now create a new extension configuration 'apcu.ini' in the '/etc/php/7.0/mods-available/' directory. Next, activate the extension using the commands below. Now, we will install the 'YAML' extension to further improve Grav performance. But before installing the extension, we need to install some packages using the following apt command. Next, install the yaml extensions using the pecl command. After the installation is complete, create a new 'yaml.ini' configuration file. Now activate the YAML extension. New additional PHP extensions for Grav have been added. Before creating a new PHP-FPM pool configuration, we need to add a new user named 'grav' to the system, something which you can do using the useradd command. Now go to the '/etc/php/7.0/fpm/pool.d' directory and backup the default 'www.conf' configuration. Next, create new PHP-FPM pool configuration - 'grav.conf' - for Grav. Restart the PHP-FPM service and enable it to launch at system boot. PHP-FPM is now running under the 'php7.0-fpm.sock' file - check it using the netstat command in the following way. And you should get the result as shown below. If you want to check the apcu and yaml extensions, you can use the following php commands. Installation and configuration for PHP-FPM has been completed. The composer is an application-level package manager for PHP. It's used for managing PHP dependencies. Install the PHP Composer using the following command. After the installation is complete, try to run the composer command in the following way. The PHP Composer has been installed. 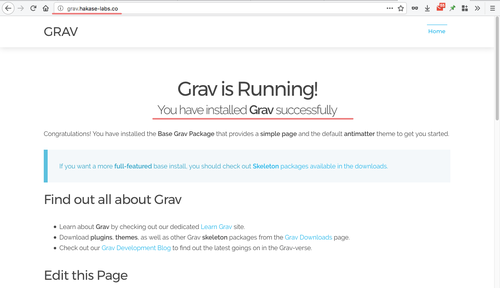 We will install and run the tool as 'grav' user. The user was created in one of the previous steps. First, login as 'grav' user. Now, create a new 'www' directory. Download the latest grav version using wget and add a '.zip' extension to the file name. Extract 'latest.zip' file and rename the 'grav' directory to 'html'. Now back to root priveliges and change the group owner to 'www-data'. Grav is now downloaded and installed by the 'grav' user in the '/home/grav/www/html' directory. In this step, we will configure the Nginx virtual host for Grav. We will create a new virtual host file named 'grav' inside the 'sites-available' directory, and then activate the Grav virtual host. Goto the '/etc/nginx' configuration directory and create a new file 'grav' using the vim editor. Paste the following Grav Nginx virtual host configuration there. Next, activate the virtual host and test the nginx configuration. Note: Make sure you get no Nginx error after testing the configuration. Now restart the Nginx and PHP-FPM services. Configuration for Nginx Grav virtual host has been completed. And you will get the default Grav homepage, as shown below. Grav Flat CMS installation using PHP-FPM and Nginx web server on Ubuntu 16.04 has been completed successfully.